The European Sustainability Academy (ESA), which provides a broad range of teaching and business consulting services, launched a collaboration with the Heracles Group , a member of LafargeHolcim. 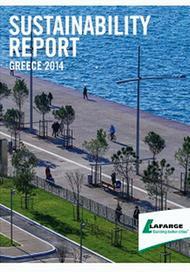 ESA provided consulting assistance for the Greek company’s 2014 Sustainability Report and ensured compliance with the Global Reporting Initiative (GRI – G4) international reporting standards. Greek WISE women in the news again! 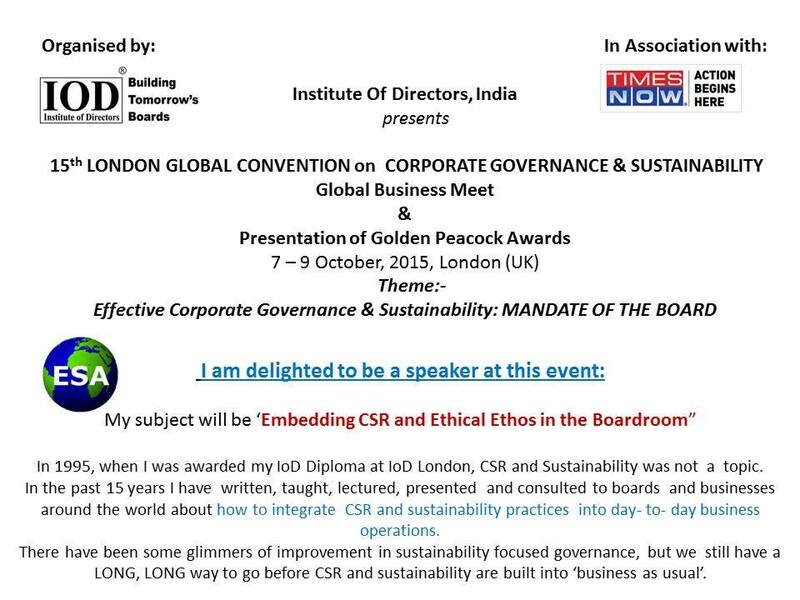 Recently I was delighted to speak about HOW TO embed ethics in responsible business at the Institute of Directors - India in London. There I met some impressive business entrepreneurs and policy makers with a deep commitment to making businesses more sustainable and more responsible in India. We are delighted that the Women Innovators in Social Enterprise (WISE) project which has been piloted in Europe (Greece, Spain and Croatia) has received such postive interest in India as a programme to help women set up enterprise and gain personal empowerment. 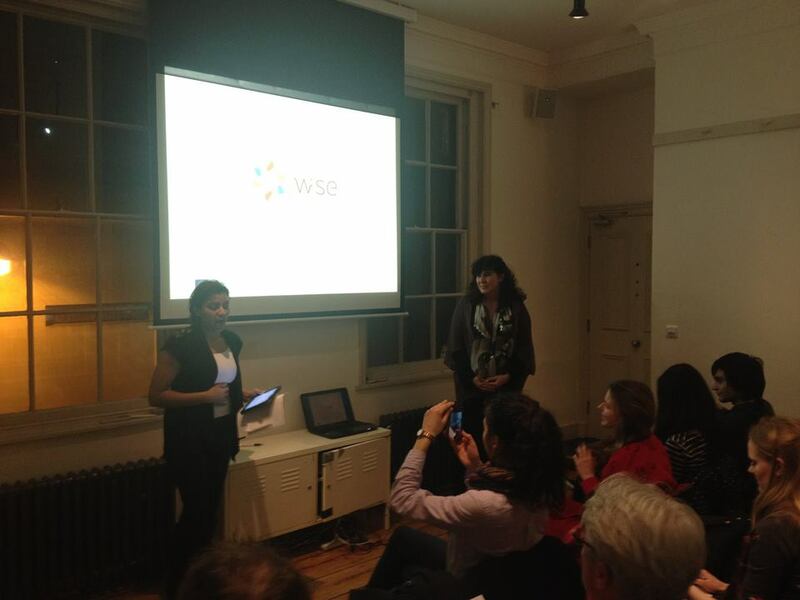 At European Sustainability Academy - Crete we are very excited by the prospect of rolling out WISE in India with global partners in 2016, including developing our partnership with Shibu Cheruvelil and his organisation Agency for Integrated Development Initiatives (AIDI) in India. 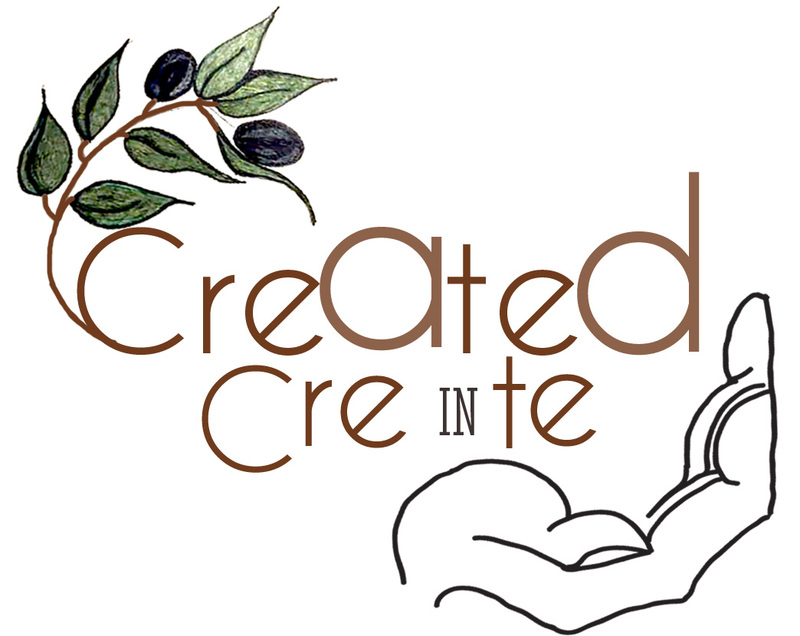 ESA is delighted to be a partner with Cretan Academy for Gastronomy and Tourism. We are excited about developing learning and development programmes together for driving more sustainable tourism practices in Crete. 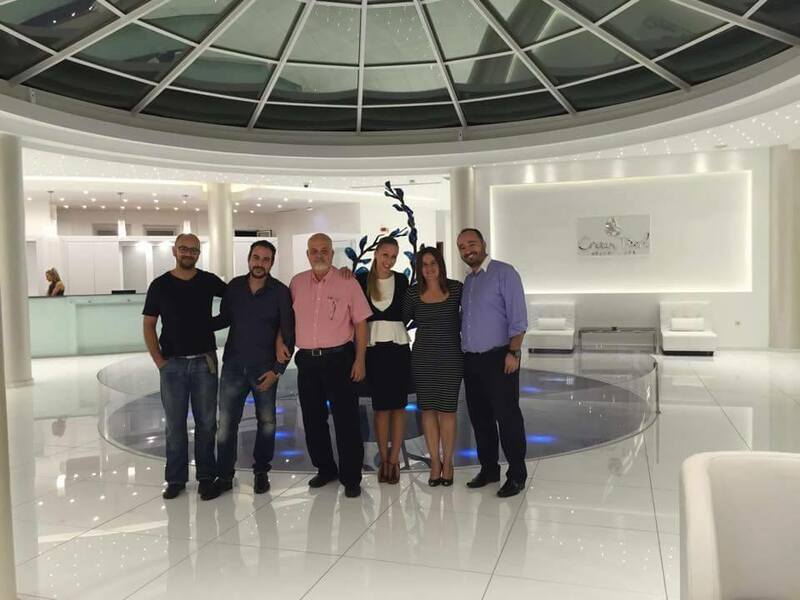 CONGRATULATIONS on such a wonderful new location for the Academy, at the Cretan Pearl Resort & Spa, Akrotiri. 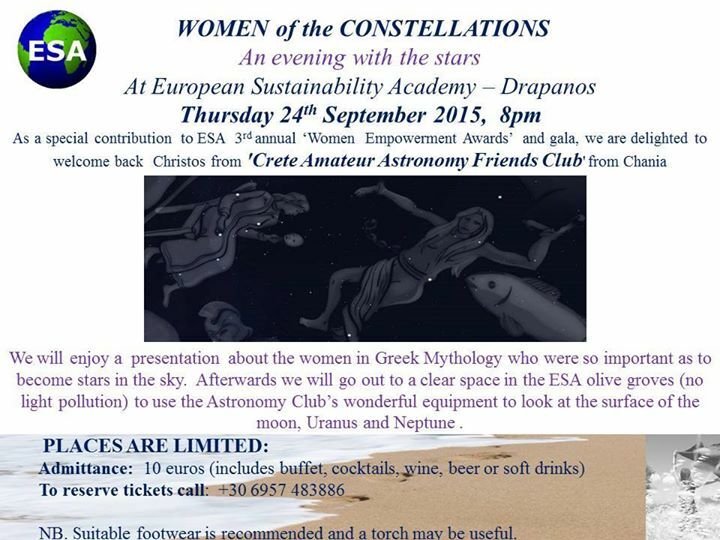 Stars and Cocktails at European Sustainability Academy - Crete THIS THURSDAY (24th Sept.) at 8pm. Catering supplied by Emerald Hotel & Restaurant. LIMITED PLACES. 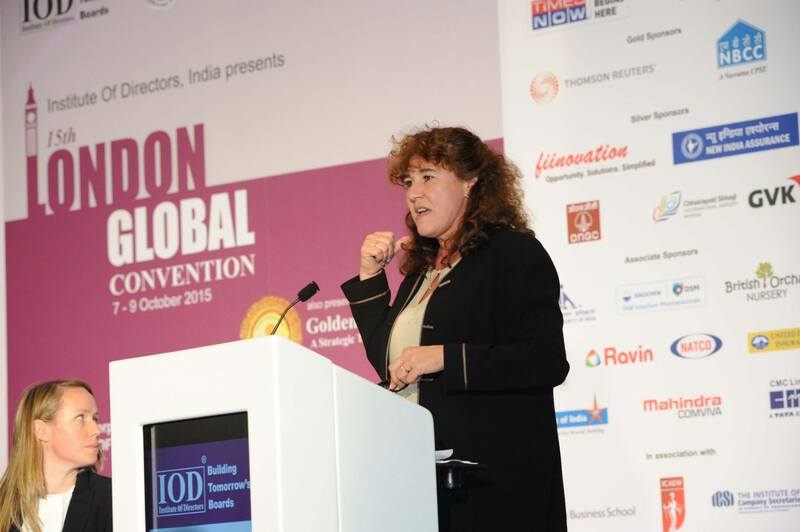 Sharon Jackson is delighted to be a speaker at this important event in London about the role of boards for driving sustainable business, organised by The Institute of Directors (IoD) India. 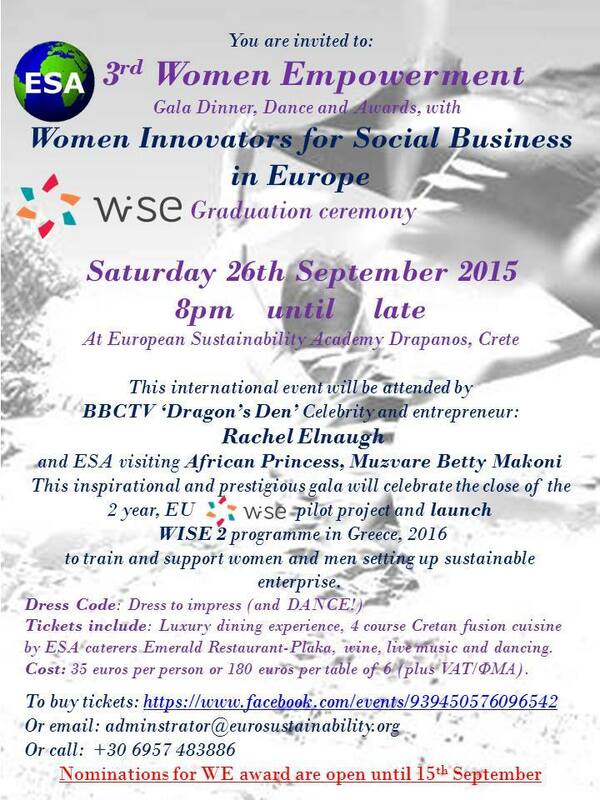 TICKETS now available for Gala Dinner Dance and Women in Sustainable Enterprise awards! With fascinating key note speakers - International award winning celebrity entrepreneurs, award winning global woman empowerment activists and executive mentors and coaches with amazing stories to share! 35 euros per person, 180 euros per table of 6. LIVE MUSIC and DANCING till late! 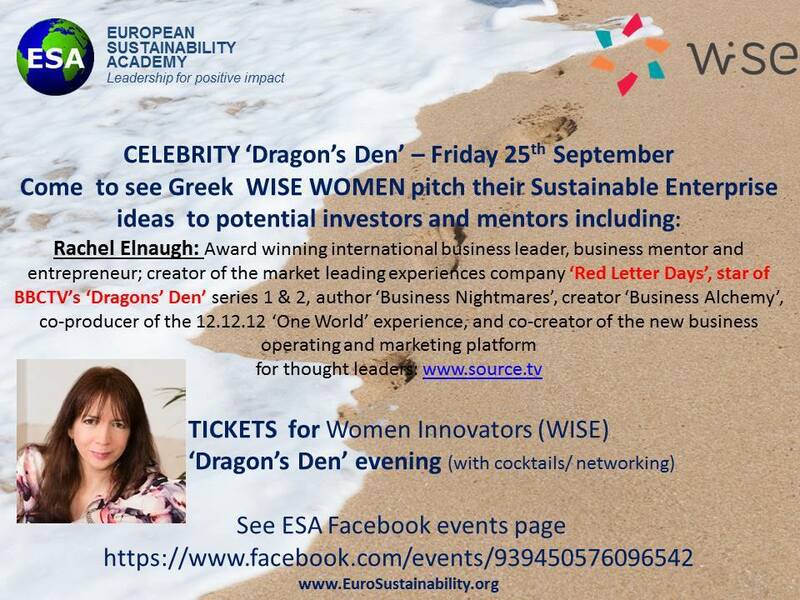 Join us for an exciting evening on FRIDAY 25th September to watch 5 of the most successful WISE Woman Innovators for Social Business in Europe Greek participants pitch their sustainable business ideas to an international CELEBRITY PANEL of successful Entrepreneurs, investors and mentors! WE WISH them luck! A very enjoyable afternoon discussing how to address the 'hot topics' of 'sustainability' and how to create positive stakeholder dialogue to stimulate action for positive impact in Greece. Thank you to all who participated. 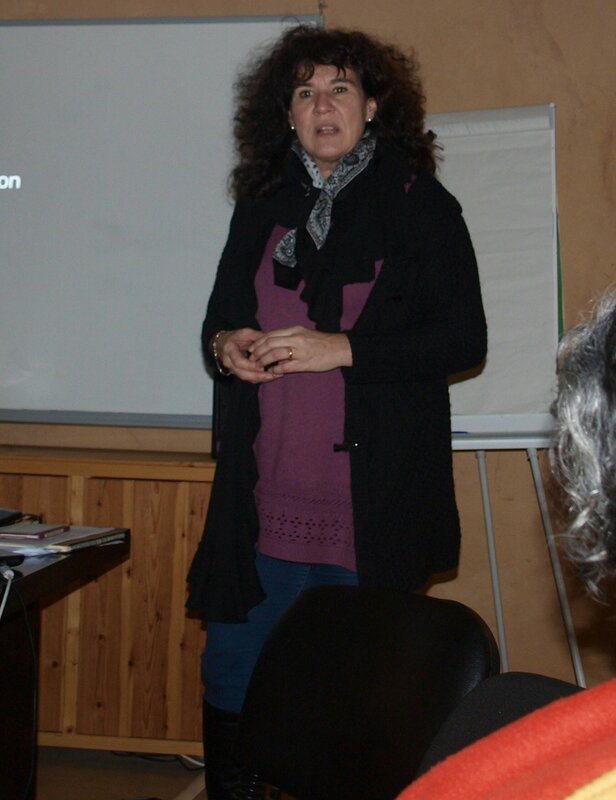 A wonderful informative lecture from John Fielding about endemic flowers of Crete. John has been visiting Crete to study the flora for over 20 years. John and Nick Turland produced the widely acclaimed book, ’Flowers of Crete’ published by The Royal Botanic Gardens, Kew. After two days full of experiential learning, knowledge sharing, passion, friendship, and networking, WISE Greece, face to face workshop came to an end. 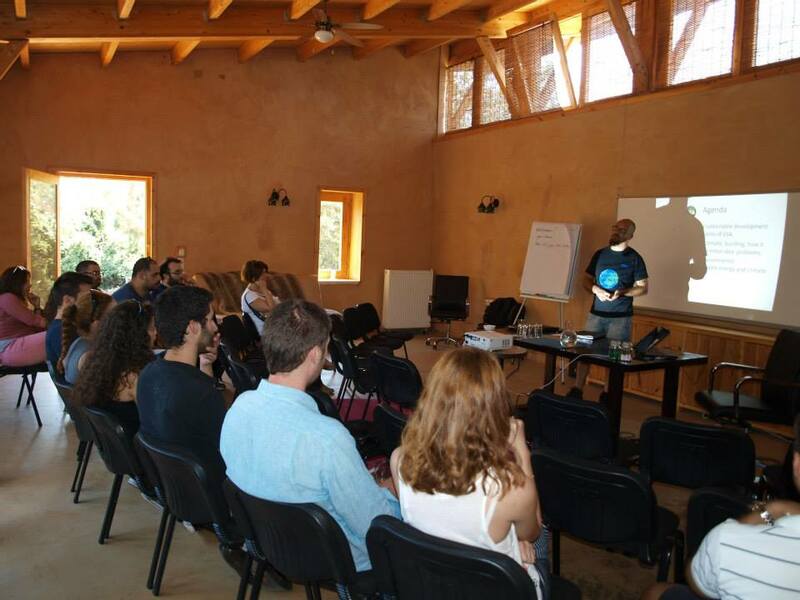 Hosted at European Sustainability Academy (ESA) in Crete the WISE experience concluded with a very fruitful end on Friday March 13th.. By the end of the workshop, what was left were smiling faces among participants, mentors, teachers and guests. Several participants said they did not want to leave, others said that the experience had been ‘life changing’. 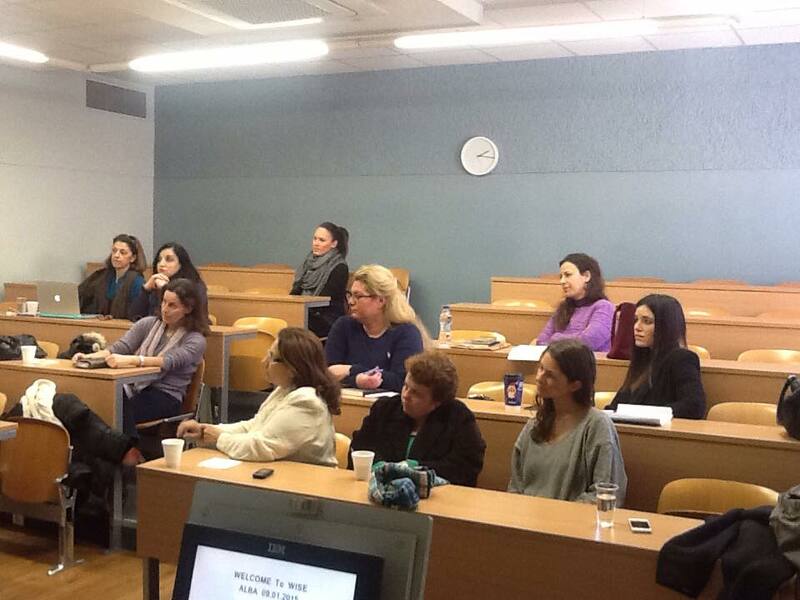 Thank you to Neha and Oxford Hub for inviting me and Yannis K. Maleganos to talk to the Oxford Women Entrepreneurs network last week, about ESA and 'Making a ...Vision a Reality' and about WISE Woman Innovators for Social Business in Europe. We made some very encouraging connections with the audience and we will be in touch soon! The kick-off programme commenced during January with 2 meetings of the WISE Greek cohort in Athens hosted by Alba School of Management and in Crete at European Sustainability Academy (ESA). This was followed by a series of virtual meetings and webinars between the full WISE cohort of women from 3 countries (20 from each). 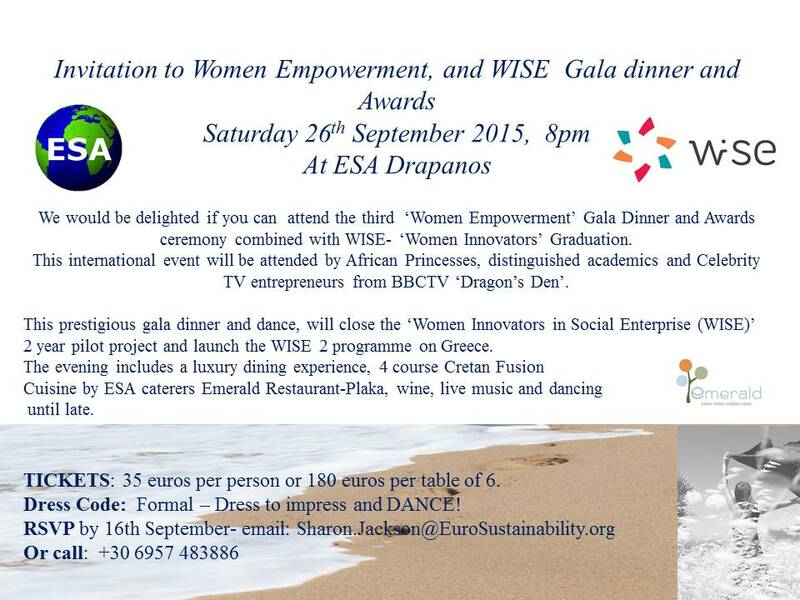 WISE is a game- changing learning and development programme for 60 women across Greece, Spain and Croatia. 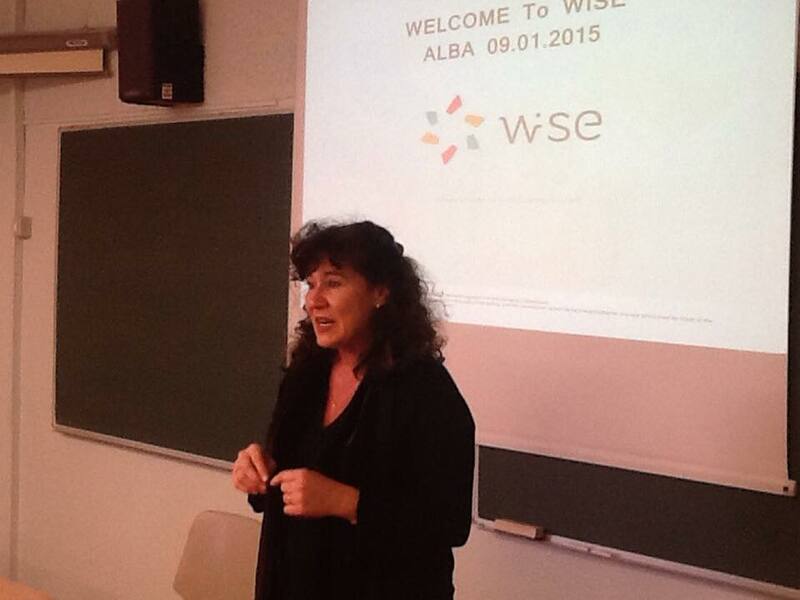 The WISE project is partly funded by EU Life-long learning programme and the main partners are ESADE Business School -Spain, HUB Zagreb - Croatia and ESA Greece. The women from all 3 countries have already created a positive and supportive on- line community through a WISE face-book group. 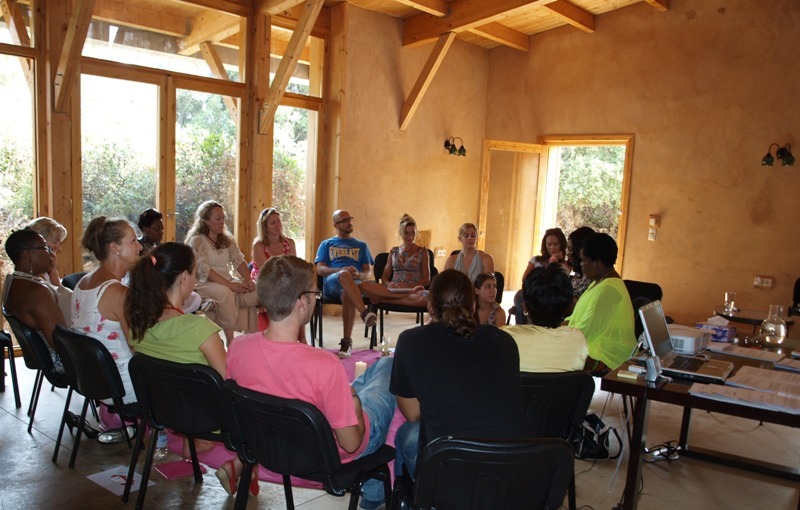 In the first 2 weeks the group as started sharing news, learning materials and exchanging business ideas. People who had not met before are already collaborating on writing book chapters and on innovates business networking and planning. One participant wrote "I consider this a mini-Masters. How blessed we are to have this opportunity!" The vision of a WISE woman is a ‘Conscious, confident person who has the clarity, community and courage to identify and seize entrepreneurial opportunities to make impact. WISE is on course to succeed in its aims! You are invited to be part of a ground-breaking short, intensive learning retreat for senior managers who are passionate about becoming Tomorrow’s Leaders, between Friday 15th and Monday 18th May at ESA Crete. 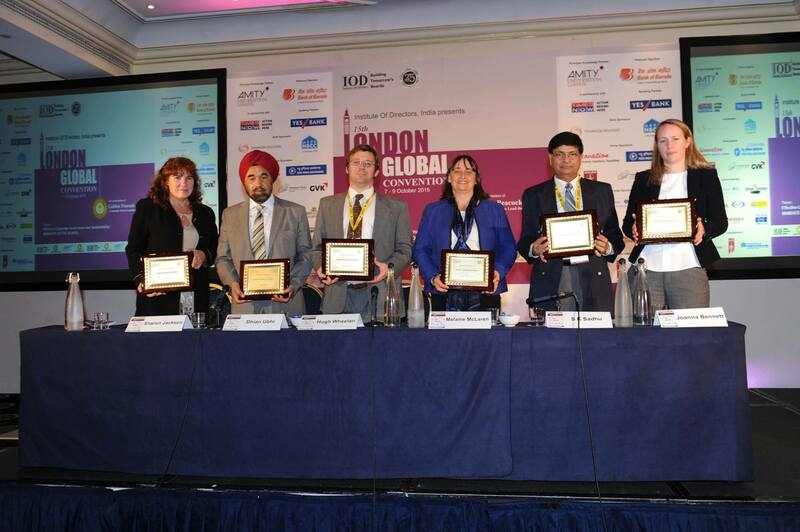 The global game has changed in business leadership. The aftershocks of the global financial crash of 2008 continue to reverberate around the commercial world. Successful business leaders of the future are increasingly aware that a radically new approach is needed. We are in a brave new business world that demands a brave new generation of leaders. This involves new leadership skills, knowledge and insight. “Tomorrows Leaders” is an intensive short course, designed to help participants to open doors in themselves that they always suspected existed, but to which they could never quite find the key. Our aim is to help you to ‘draw out’ your true, full potential as leader. 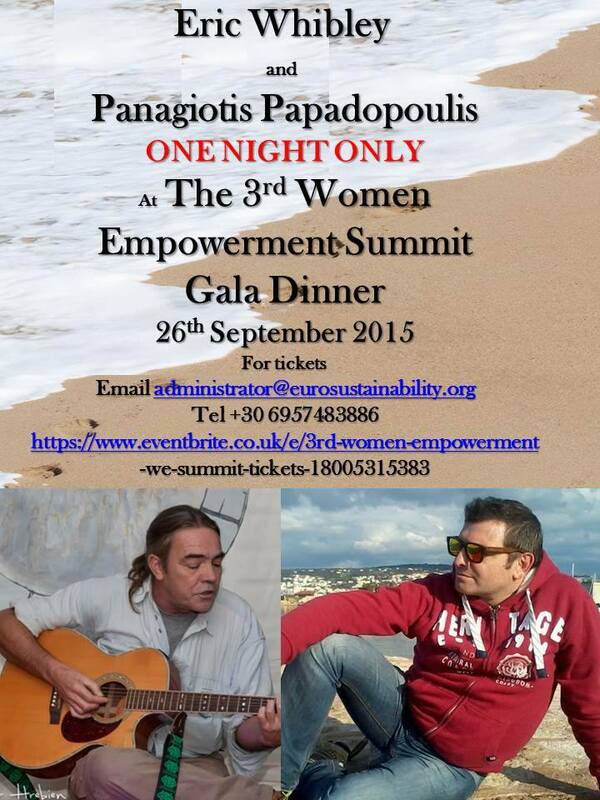 The event runs at the European Sustainability Academy near Drapanos, Crete. Direct Flights to Chania are available from London, several other UK airports and major European cities. There are a maximum of 20 places available. We are extending the early bird special price to end of February for the first lucky few who book early! Don’t forget that travel prices (flights) go up in price closer to the date of travel so we advise you to book your flights to Chania as early as possible. At the time of writing, return flights from UK are available for just £100 and €50 or less from Athens. 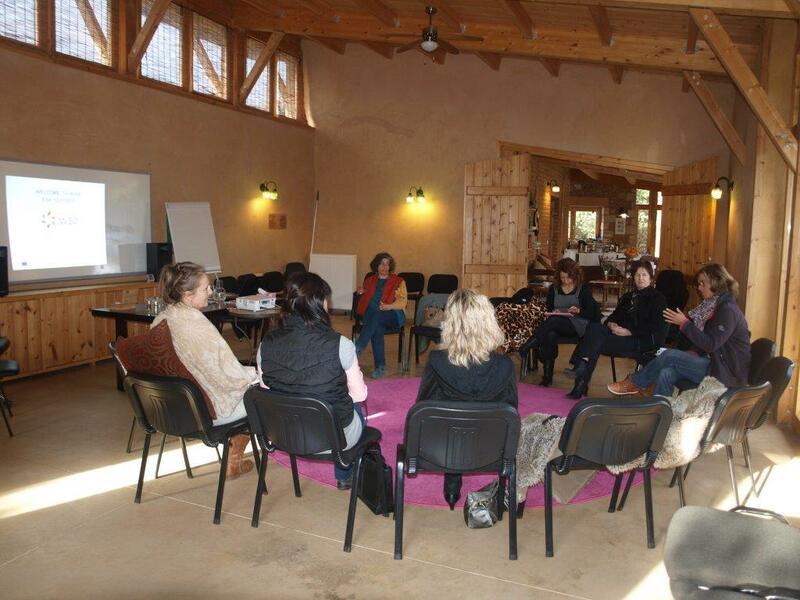 WISE Women WISE Woman Innovators for Social Business in Europe training programme HAS STARTED! 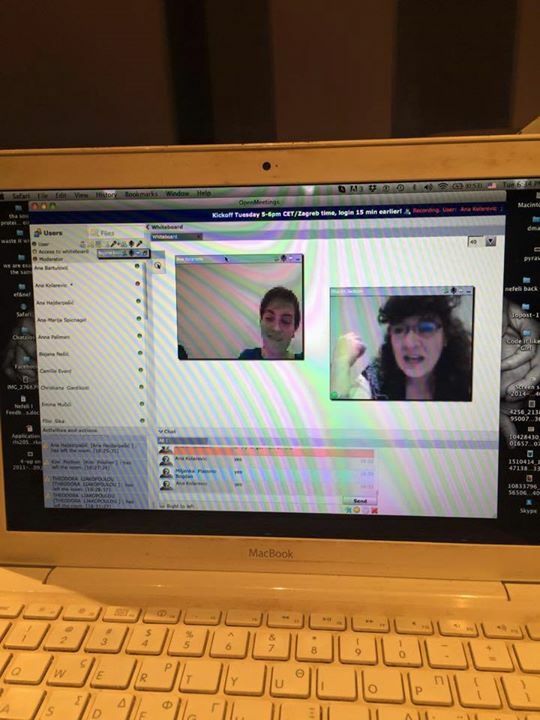 Over the past 2 days 60 women innovators have connected by webinar from Spain, Croatia,Greece, Cyprus Holland, Germany to kick off the programme. The positive energy and sense of sharing is ELECTRIC. ESA has joined up with Global Sustain from Athens to co-organize the "Corporate Responsibility and Sustainability Day"
Post date: 15th April 2019. 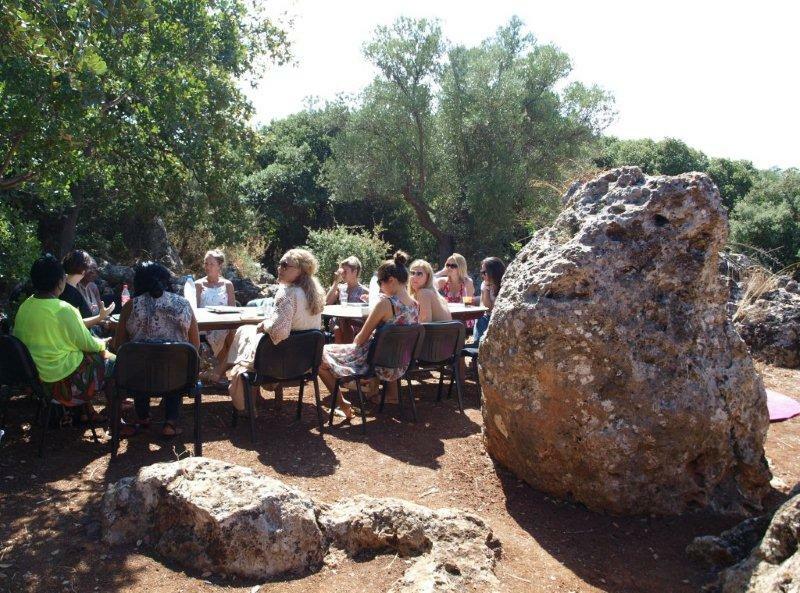 ESA hosts the first TEDxWomen event in Crete on 30th November 2018. Post date: 1st October 2018. ESA is committed to providing international, high calibre management learning for the development of skills, knowledge and experience necessary to grow organisations through the practical application of sustainable business models. Sustainable business needs new thinking, innovation and creativity which is rarely provided by mainstream business teaching. 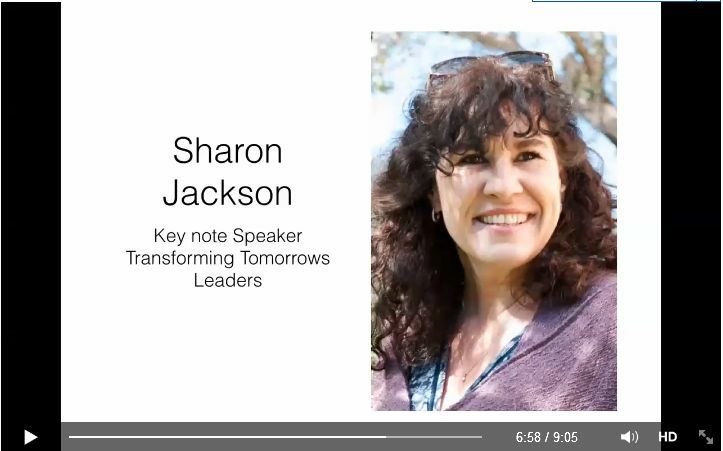 ESA founder Sharon Jackson has been teaching and lecturing on sustainable leadership and management since 2000, and believes that busy executives can focus on the principles of sustainability in a more meaningful and practical way when energised by a rich ecological backdrop. Our passion is contributing towards co-created sustainable enterprise for positive impact on communities and the natural environment on a global scale. Leadership and entrepreneur issues of adaptation, resilience, authenticity, sustainable-self, values connected sense-making and the continued emancipation of women (WISE) to take up more leadership roles in the world are at the core of the ESA sustainability experience. Crete is the sustainable destination of the past and of the future. Home of the Minoans, one of the earliest civilisation on earth, nestled between Europe, Africa and the Middle East, Crete is rich with mythology, gastronomy, music, art and agriculture. You can have your own authentic experience of a sustainable lifestyle and feel first hand the strong connection between nature and community. ESA is thrilled to collaborate with Cretan Urban Adventures to co-create an 'immersive experience' for a richer connection with LIFE!